(1) Attach the pulley to a suitable anchor point. (2) Anchor one end of the rope to the load. (3) Run the other end of the rope through the pulley. (4) To equalize the load, pull the rope until there is tension on the system. If the load weighs 100 lbs., theoretically it should only take 100 lbs. of force to lift the load, but due to friction it may require 110 lbs. of force to equalize the load. To lift the load one foot, you will have to pull the rope one foot. (5) This is referred to as a directional pulley or redirect, and gives no mechanical advantage at all. b. Construction of the 2:1 ratio system (C-pulley). (1) Attach one end of the rope to a suitable anchor. (2) Attach a pulley to the load. (4) Now you can raise the load with the amount of force that is equal to half of its weight. (5) To lift the load two feet with this system, you must pull four feet of rope through the pulley. (6) When each rope is equalized, divide by two. So if the load weighs 100 lbs., each line has 50 lbs. of supported weight. (a) Anchor one end of the rope to a suitable far anchor using the tree wrap method. 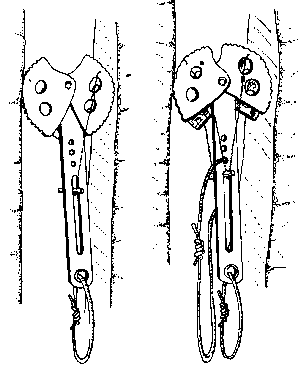 (b) Tie a swami wrap around the near anchor and clip a steel-locking carabiner with the gate up and large axis facing the far anchor. This carabiner is referred to as the Main Anchor Carabiner (MAC). (c) Take the running end of the rope from the far anchor and clip it into the MAC. 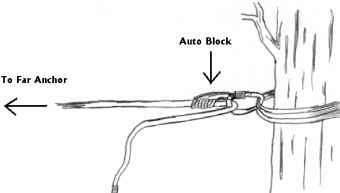 Tie a stopper knot (Auto block), with a short prusik on the rope and attach it back into the MAC and lock it down. (d) Using another short prusik, come out from the swami wrap a few feet and tie a stopper knot (French prusik) on the rope and clip a steel locking carabiner into it with the direction of pull towards the near anchor. Clip the running end of the rope from the Auto block into the carabiner and lock it down. (e) Now pull the running end of the rope to tighten the rope installation. (b) Tie a swami wrap around the near anchor and clip a steel locking carabiner through all the wraps with the gate up and large axis facing the far anchor. This carabiner is referred to as the Main Anchor Carabiner (MAC). (c) Take the running end of the rope from the far anchor and clip it into the MAC. Tie a stopper knot (Auto block), with a short prusik, on the rope and attach it back into the MAC and lock it down. (e) Take the running end of the rope back to the swami wrap; attach another steel locking carabiner into the MAC with the large axis facing down and out to the far anchor. Clip the rope into this carabiner and lock it down. (f) Holding the rope that runs between the 2nd stopper knot and the carabiner hanging from the MAC, go back to a few inches before the French prusik and tie a 3rd stopper knot (French prusik) on that line of rope with a steel locking carabiner attached to it. Take the running end of the rope and clip it into the carabiner and lock it down. (g) Now pull the running end of the rope to tighten the rope installation. NOTE: Care must be taken when increasing the ratio system. Breakage and damage of the ropes, carabiners and pulleys is very possible if the force end of the rope is greater than the load end of the rope. No more than two men will tension the installation at any time if using pulleys. TRANSITION: Are there any questions over the construction of the systems? Because we are Marines, we are used to carrying a great deal of weight. But when we are in the mountains we should take every opportunity to lighten our loads and reduce the amount of work we need to do. If you have no questions for me, then I have some for you. a. Students will use a mechanical advantage system to tighten a rope installation. Practical application of this will be on the one Rope Bridge. a. The instructors will assist the students when constructing the one Rope Bridge. Q. What are the two practical uses for the mechanical advantage system? A. (1) As a tightening system. (2) As a device to raise personnel or equipment up steep or vertical terrain. a. During this period of instruction we have discussed the terms and definitions, the practical uses, the equipment required for the construction of the 2:1 (C-Pulley), the 3:1 (Z-Pulley) and the 9:1 (Z-Z Pulley) ratio systems. b. Those of you with IRF's please fill them out at this time and turn them in to the instructor. We will now take a short break. How to tell a rope ratio of 2:1?